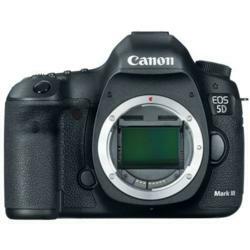 The Canon EOS 5D Mark III, available at Adorama.com, takes the groundbreaking qualities of its predecessor to a new level. The Canon EOS 5D Mark III’s astounding autofocus performance is directly inherited from the flagship Canon EOS-1DX. The camera’s high-density reticular 61-point AF system provides much faster, more precise focusing than its predecessor; a full 41 of those AF points are the more accurate cross-type. What’s more, the new model has a full-resolution framing rate of six frames-per-second, much faster than the 3.9 frames-per-second of its predecessor. The Canon EOS 5D Mark III’s shutter is also much quieter, and it features the “silent” mode found on the flagship Canon EOS-1DX. TTL metering is now performed even more accurately with 63 zones vs. 35 in the previous model. About Adorama: As one of the nation’s largest photo retail and mail order suppliers, Adorama has served professional and amateur photographers for 33 years. It has recently expanded its service to the community through online photo education (the Adorama Learning Center and Adorama TV) and on-site workshops, programs that make it a unique industry resource. Adorama’s vast product offerings now encompass home entertainment, mobile computing, and professional audio, while its services include an in-house photo lab (AdoramaPix) and pro equipment rental (Adorama Rental Company). Knowledgeable staff and unbeatable pricing make Adorama a one-stop shop for all your photo and technology needs. Visit http://www.adorama.com.